Starting off during the same year when Bitcoin was introduced to the public as a digital currency, Anonibet was amongst the first online sportsbook to launch and offer payments with it to the potential user base. It was a move that guaranteed exposure and the site has been redesigned since in order to accommodate the larger traffic and improve their offer of sports matches and events. They’ve recently added a fully functional Bitcoin casino that complements the offer of sports and live betting, with a selection of high quality bitcoin casino games. Anonibet’s “selling” feature is their anonymous policy, i.e. making an account requires only a valid email address and a password. The site will not ask for specific personal information and you can use your Bitcoin wallet to place/withdraw funds immediately after sign up. 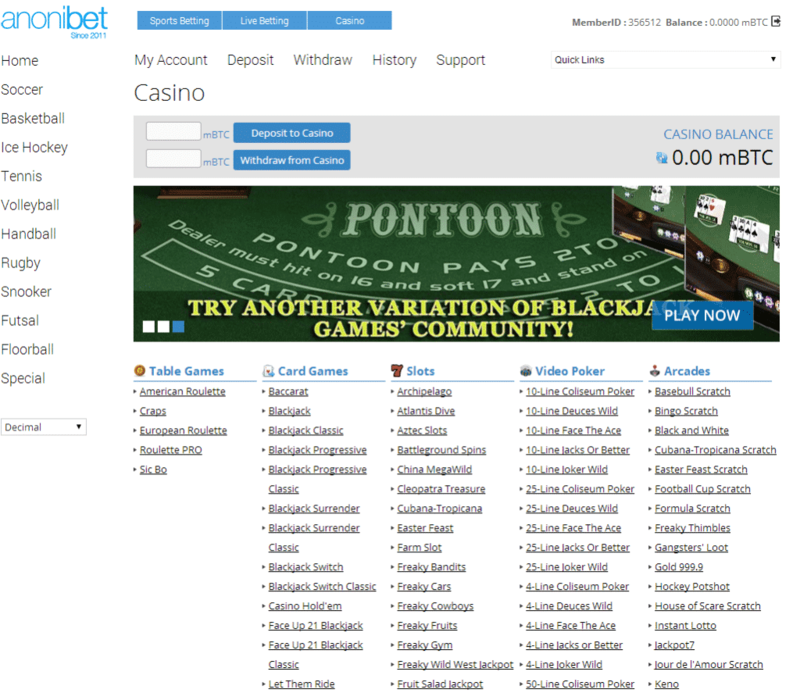 The overall design of AnoniBet is barren of anything flashy and animation heavy, with only a handful of menus and links that might clutter the screen. All relevant information is placed in separate categories including the account, deposit, withdrawal, history and support, as well as a portion dedicated to the site’s blog and language selection. This creates a very user friendly, fast paced and informative experience when placing bets on live events or opting for casino games. The site is also tailored and optimized for mobile usage. 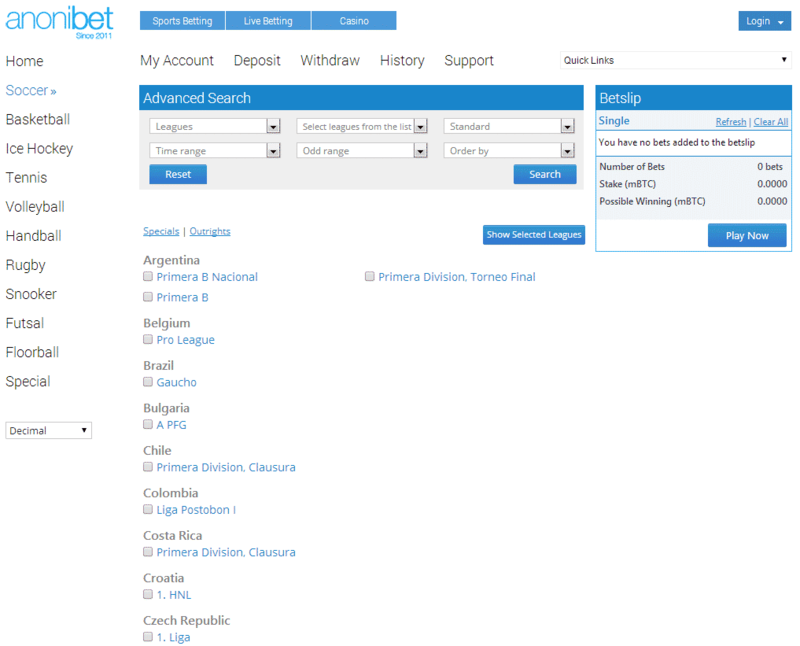 The site boasts an advanced search feature which can be used to filter and select bet types, odd range, etc. Users can choose several odds formats, including decimal, fractional and American. The offer and variety of the types of bets present at Anonibet is extensive and varies from sport to sport, featuring the likes of specials, outrights, first and second half totals, handicap 0-1, 1st and 2nd half, draw no bet, double chance and more. An excellent addition is the multiple bet option, which increases the chances for winning a given bet by splitting the picks on several parleys. 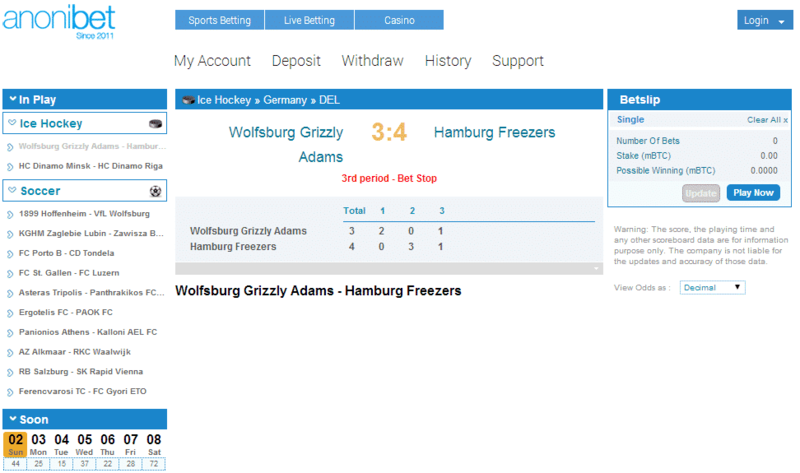 Live betting is also supported, with upcoming events highlighted and updated regularly, with interchangeable odds and possibility to place bets on the spot. Placed bets cannot be canceled and are locked until the match/event finishes. The only possibility where the sportsbook might offer refunds is if there was a mistake or the match was cancelled. Soccer – country specific featuring popular leagues such as Spanish Primera Division, England’s Premier, Germany’s Bundesliga and Italy’s Serie A, as well as Specials like the World Cup 2014, Champions League and more. Basketball – country specific including USA’s NBA and international like the Liga ABA, Baltic Basketball League, Playoffs, etc. Ice Hockey – the selection includes country specific match ups from USA’s NHL and AHL, Russia’s KHL and VHL and others. Tennis – all major events are covered including ATP, ITF (men and women) and WTA. The casino offer extends to cover popular casino categories such as slots, video poker, table games like roulette, blackjack and baccarat and a collection of Asian games as well. The software powering the casino is proprietary and offers sleek graphics with simple animations. Making a deposit with Anonibet is easy and accessible with only a Bitcoin wallet and a simple process of creating an account with the bitcoin sportsbook. Keep in mind that the casino is separated from the sportsbook account so if you want to try it out you will have to add funds there as well. All transactions are conducted using Bitcoins, with a transfer rate of 1 BTC for 1000 mBTC. The minimum for deposits is set at 0.001 BTC. All deposits are instantaneous, though if there is high demand the site might require some time to process the request. Withdrawals on the other hand have a maximum limit set at 500 BTC for every 24 hours, and are approved manually meaning you will have to wait at least several hours for the funds to be transferred to your Bitcoin wallet. 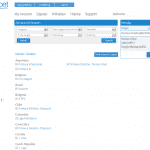 Anonibet claims that this is due to security reasons, i.e. making sure the safety standards are being applied for every transaction. If you have an issue, question or a general suggestion for the sportsbook or casino, you can contact Anonibet’s customer support via their email service. They are quite responsive even when there is high traffic on the site, and will respond after several hours of your request. 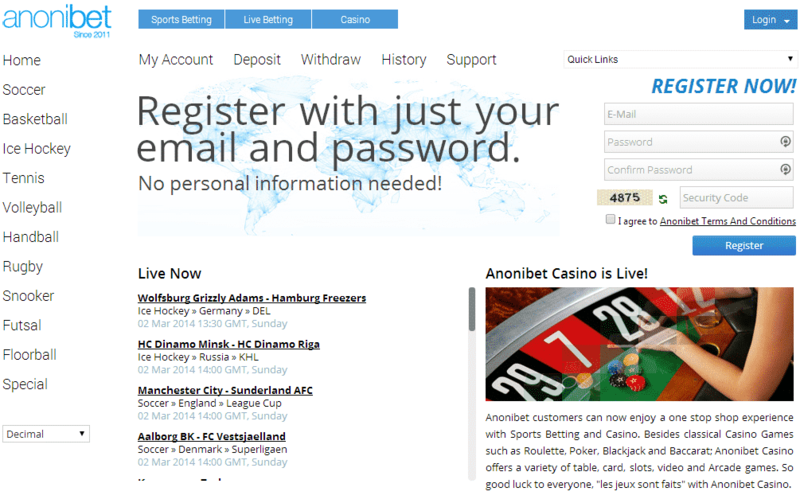 Anonibet has tradition and experience on their side when attracting new users. Their updated platform now includes faster payments, more betting options and sport events, as well as a fully functional online casino for much additional variety. Their approach for easier access that only requires an email and a password should appeal to those concerned with online safety.